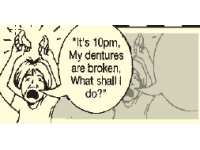 Genuine 24 Hour Service For All Types of Denture Repairs and Additions. Free Parking, Over 36 Years Experience. Situated Not Far From Tottenham Football Grounds.